IDF Chief of Staff Benny Gantz vows to keep protecting Israel's borders after skirmish, but notes incident is par for the course. IDF Chief of Staff Lt. Gen. Benny Gantz, stated that the IDF would continue to quash escalation along the Gaza border Wednesday, after a skirmish left a soldier critically injured. 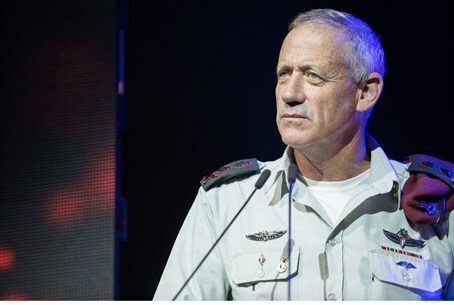 "Instability is a regular feature in the life of the IDF and every border of the State of Israel," Gantz stated Wednesday afternoon, at the Calcalist conference. He said that the IDF has already responded to the incident and will continue to do so immediately if events such repeat themselves. "We have no intention of allowing these incidents to pass unanswered," he said. "We responded to the incident in the area and we will work correctly and powerfully as required in the future." The IDF soldiers were guarding work on the security barrier with Gaza in the vicinity of Kibbutz Nirim and Nir Oz, to the south of the Hamas stronghold, when they came under fire Wednesday morning. The battle that followed critically injured one IDF soldier and killed a top-ranking Hamas commander - Tayseer al-Ismary (33), head of the surveillance unit in Hamas's "armed wing," the Al-Qassam Brigades.